Salt and Pepper Chicken made in the ActiFry. 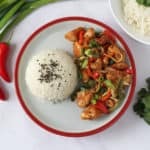 A healthier twist on this classic Chinese takeaway dish! Add the diced chicken to a bowl and cover with the milk. Stir and put to one side. Add the cornflour to another bowl and mix in the salt, pepper, garlic powder, Chinese 5 spice and paprika. In three batches, remove the chicken from the bowl with a spoon, draining off any excess milk. Add to the bowl with the cornflour spice mix and coat the chicken pieces completely. Transfer to a plate. Repeat the process with the other two batches of chicken. Chop the onion, garlic, chilli and pepper and add them to the Actifry, along with the chicken. Drizzle in one ActiFry spoon of olive oil or spray on some spray oil. Close the lid and set it to Mode 3 (Breaded Snacks) for 20 minutes. When the 20 minutes is up open the lid and test the chicken. If you prefer it a little crispier then cook for another 2-3 minutes. You can also add some salt and pepper too. When ready, remove, garnish with chopped spring onions and serve immediately with sides of your choice – boiled rice, noodles and wok fried greens all work really well with this dish.